It's October people...the beginning of boot-wearing weather (at least here in the south)!!!! I've expressed my love a time or two for booties and how they have staying power, right? Not only are they super versatile (can be worn with jeans, skirts, cropped pants, dresses, etc. ), but are a fail-proof outfit chic-maker (did you know that was a term?). 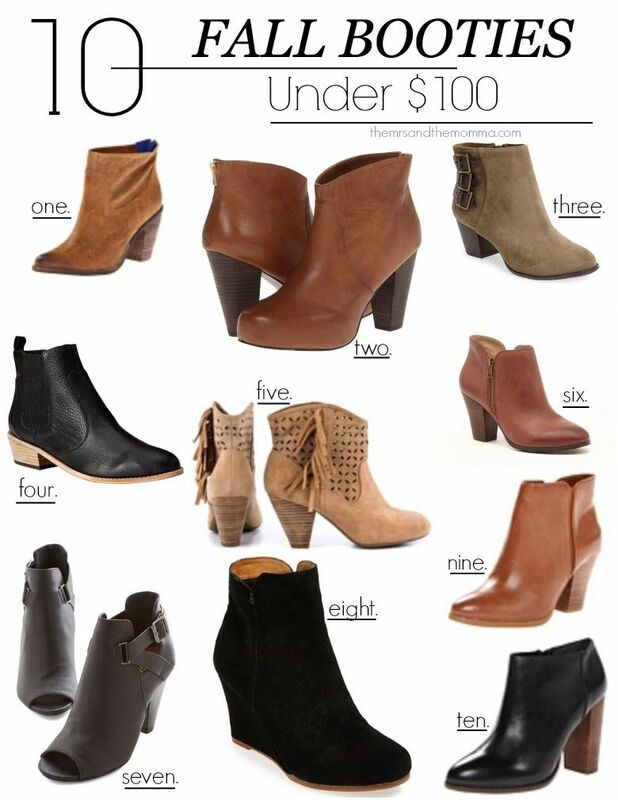 I've compiled 10 of my favorite booties in stores right now that all are under $100!!!! There are several even in the $50 range, which is a total steal considering the quality and materials with which they're made. STYLE TIP: If you're on the fence between investing in a black or brown bootie, go for the brown/cognac color. You'll get more wear out of them, as the brown can be paired with anything...especially black outfits. In my personal opinion, the cognac shades look more sophisticated, refined, and effortless.